What's really interesting about the data is that I was under the impression that the UK ebook market grew last year by some noticeable amount. But if you look at the numbers above, it shrank. Consumers are reporting that they spent less. 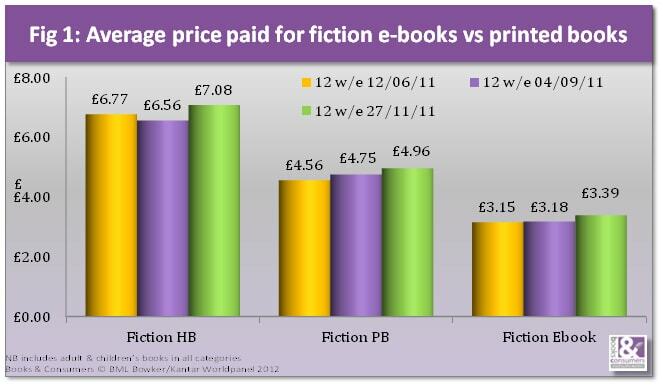 They're buying a very slightly larger number of ebooks than before, but they're spending less. I'm going to hold out for more data before I jump to any conclusions. Bowker plans to release the rest of the results at their conference in London in March, and once that data is in hand then I will try to figure it out. Here’s another interesting study, this time about the US market – ‘eReader Sales Outstripping eBook Unit Sales Growth’. Always remember the old rule of gigo (garbage in garbage out) in such studies. Stats for self publishers are missing in action & all I’ve seen are guesses, though http://ebookcomments.blogspot.com/ has got some interesting charts for the months of 2011, suggesting selfpublishing could be almost one-third of ebook market unit sales.